My design scholarship is rooted in the translation of natural movement, texture, and phenomena into original surface and textile designs. My previous work has been influenced by ocean seafoam, the flow and texture of lava, the concentric design of tree rings, the color work and movement of butterfly wings, and patterns of feathers on birds. 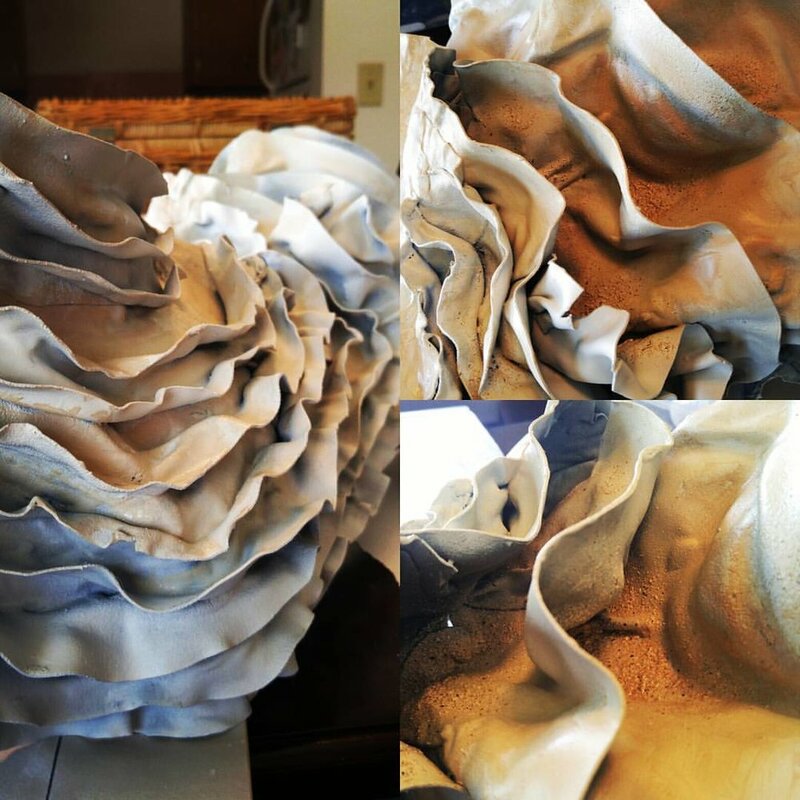 After living in Oregon for four years and witnessing the natural beauty of the Oregon coast from the cliffs of the Coastal Range to the miles of beaches covered in driftwood and oyster shells, my current scholarship is aimed at developing new surface design techniques to represent the naturally occurring phenomena along the Oregon Coast. Oyster Shell is the second in a series of garments dedicated to the natural elements found along the Oregon coastline. By focusing on translating the natural elements of the coast into wearable art I hope to raise awareness of social responsibility to the environment. My specific focus for this series is to look at parts of nature that are not considered traditionally beautiful but are still important to protect. Pacific oysters are one of the most widely cultured and consumed oysters in the seafood marketplace (Ge, Li, Yu, & Kong, 2015). The Pacific oyster comes in three color variants: white, black, and golden, with the golden variation being the most rare and expensive for consumers (Ge et al., 2015). The shell of an oyster is formed by the layering of calcium carbonate and protein, and primarily serves as a protection for the soft tissue inside. The shell also serves as a surface for algae, barnacles, and other microorganisms to live. The Pacific coast oyster market is a nearly $100 million a year industry, and has recently been crippled by the effects of climate change (Welch, 2013). The spread of Pacific Oyster Mortality Syndrome, a Tasmanian born virus perpetuated by continually warming waters, and ocean acidification have led to widespread early mortality rates of oysters throughout the Pacific Ocean. The aim of this project is to translate the surface design of a golden oyster shell on the beach into a wearable art piece. The design process of the garment started with exploring previous designers’ endeavors into representing coastal phenomena and embellishment techniques. Three garments in particular from Alexander McQueen’s 2001 VOSS collection utilized actual mussel and oyster shells to form the body of the garments (Bolton, Sundsbø, Blanks, & Frankel, 2011). These three garments served as a jumping off point to designing something unique and of a material that would last longer than natural shell and be more durable. Rather than use actual shells in the garment, I chose to sculpt the body of the jacket out of Worbla’s Finest Art, a thermoplastic material typically utilized for costume armor making and theatrical purposes. Worbla is a hard plastic material that can be shaped and adhered to itself when heated. The plastic then solidifies when cooled. To hold its shape when cooling, Worbla has to be formed over a mold or solid form. The overall silhouette of the ridges and structure were first built up on a dressform using plastic wrap and duct tape. Once the form was completely covered in duct tape, the worbla was heated in strips with a heat gun and sculpted directly on the form. Each layer of heated Worbla adhered to the previous layer, requiring no glue, sewing, or wire to hold up the shape of the piece. The overall goal with the silhouette of the piece is to make the wearer appear that they are wearing an open oyster shell. The final structure is rigid and hard like a real shell. The outer garment was formed as two halves and velcros together up the center back. Once shaped the piece was primed with spray primer and hand painted in layers to build up dimension in color. Deep crevices in the ridges of the shape were additionally filled with sand and stone textured spray paint to represent the growth of algae and barnacles that usually grow and thrive in the grooves of a real oyster. The underdress was designed to represent the smooth white pearlescent surface inside of an oyster. The dress was developed using draping techniques and is constructed out of a polyester crepe fabric. The dress zips up the back with an invisible zipper. The dress is embellished with small pearl and iridescent beads at center front. The skirt portion of the dress was designed with added flare and is shaped with horsehair braid. Bolton, A., Sundsbø, S., Blanks, T., & Frankel, S. (2011). Alexander McQueen: Savage Beauty (First Edition, Later Printing edition). New York : New Haven, Conn: Metropolitan Museum of Art. Ge, J., Li, Q., Hong, Y., & Kong, L. (2015). Mendelian inheritance of golden shell color in the Pacific oyster crassostrea gigas. Aquaculture. 441. 21-24.